NEA Chairman Dana Gioia joined U.S. Representative Sam Farr at the National Steinbeck Center in Salinas to announce the grants, which are part of an NEA partnership with the Poetry Foundation to celebrate the nation's historic poetry sites. UC Santa Cruz, the National Steinbeck Center, and the Robinson Jeffers Tor House Foundation will each receive funds to host a range of activities centering on Jeffers's life and work. Once shunned for his unpopular political views and harsh critiques of mankind's egotism, Jeffers has regained popularity in recent years as one of environmentalism's most forceful poet-advocates. Featured on the cover of Time magazine in 1932, Jeffers's major works include the Roan Stallion, Tamar and Other Poems (1925), The Women at Point Sur (1927), and a 1946 adaptation of the Greek drama Medea. 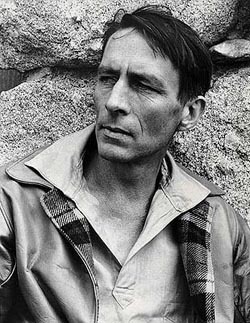 "I am delighted to partner with the Poetry Foundation to celebrate the great American poet Robinson Jeffers and his deep connection to California and to our nation's Pacific coast," said NEA Chairman Gioia. "Jeffers's hard-edged yet musical poetry continues to challenge and inspire all Americans to greater care and stewardship of our natural resources, and it's fitting that we announce these grants here in the landscape that he so loved." "The Central Coast has a rich history of literary genius, from the powerful works of John Steinbeck to the moving poetry of Violet de Cristoforo," added Rep. Farr. "The NEA's support for these programs highlighting the life and work of Robinson Jeffers helps build on this tradition. It's important to our communities to keep our history alive, and there is no better tool to instill an appreciation for art in our youth than to let them experience just how moving it can be." UCSC will receive $5,000 to host a symposium on the work of Jeffers. The celebration will feature a keynote address on Jeffer's life and work, a staged reading of his adaptation of Medea, and readings by award-winning poets, including Adrienne Rich, Li-Young Lee, and Mark Jarman.